It’s been a big couple of months for Facebook — the site launched its Places feature in August, had a major gaming-focused event two weeks ago, and recently revamped its photos feature to allow for high-resolution uploads (which is a big deal). And it’s not done: an invite just landed in our inbox for a special event this Wednesday morning at 10 AM. Facebook isn’t giving any hints as to what this event will cover (sometimes they do — they told us in advance that the last event was focused on gaming). But the fact that they’re trying to get a bunch of reporters down to Palo Alto at 10AM would seem to indicate that this is important (please). Oh, and they’re giving us shuttle service, which probably means they’re inviting a lot of press. iPad: The lack of an official Facebook iPad app has been glaring since the device launched six months ago, and while some third party apps have stepped up to the plate (and done very well financially), a Facebook app is still nowhere to be seen. (More) Places: Facebook Places launched in mid-August, and it’s still missing some key features, particularly on the desktop version of the website. Likewise, we could see a much larger campaign urging local businesses to become active on Facebook Places. Credits: Facebook Credits are being used in more games (they frequently came up in the gaming event last month). But what about a broader launch that lets anyone use them? The Facebook Bar – Facebook has been working on a Meebo Bar clone for ages now — they even announced it at f8. Where is it? The Facebook Phone: They denied it existed. Then they said it sort of does. A full launch is the next logical step, obviously. 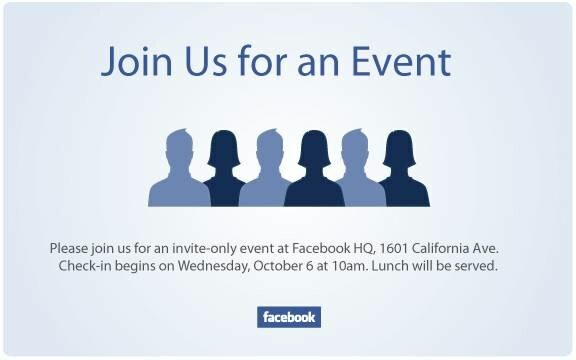 Update: As has been pointed out to us about a dozen times now, the invitation also uses the word ‘Event’, which could be a hint pointing to news around Facebook Events. Or maybe Facebook just used that word because it’s, you know, an event.